Ada Zingara photograph, ca. 1890s, Chicago, Illinois; digital image 2013, privately held by Melanie Frick, 2013. 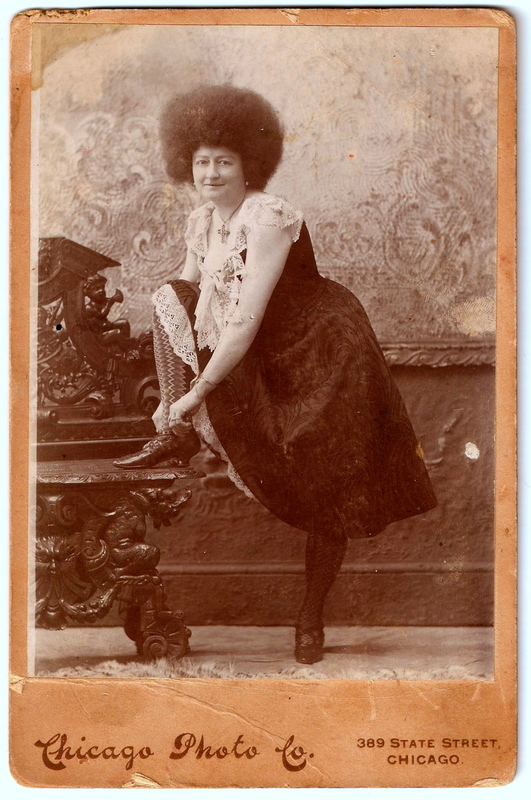 The name Ada Zingara is handwritten on the back of this photograph, which features a woman posing in a rather scandalous fashion. Her dress is short, and she stands with one leg elevated on a bench as she pretends to fasten her pointy-toed shoe. Her stockings feature bold zigzags, and her dress is patterned as well. The bodice is trimmed with lace and loose cap sleeves, and the border of her lace-trimmed petticoat is also visible. She wears earrings, and a large, bejeweled crucifix lies at her throat. What is most striking is her hairstyle: Ada’s hair is teased into an Afro. A search for Ada Zingara informed me that, in the early 1900s, she was a snake charmer. A 1906 sideshow advertisement specified that she had a den of “Five Big Anacondas.”2 However, I wondered why she was not posing with snakes in this picture, which was surely printed for publicity. And why did she have such a dramatic hairstyle? A close look at her face reveals that Ada Zingara is not very young. There are lines around her eyes, which gaze warmly at the camera. Her lips part in a faint smile, showing her teeth – and a possible missing tooth. Why did Ada turn to sideshows, and what became of her? What was her real name? What I find especially interesting is the fact that this photograph occupies the very first page of the album – the page usually reserved for an important family member or the primary subject of the album.4 Of course, it’s possible that the photographs were rearranged in the years that this album made its way from its original home to the antique store. Whatever the case, it should be noted that this is not the only photograph of a circus or sideshow performer located in the album. The family of Kaukauna, Wisconsin must have enjoyed these attractions! Did your ancestors collect photographs of circus or sideshow performers? 1 Unidentified Album of a Kaukauna, Wisconsin Family, ca. 1870-1900; privately held by Melanie Frick, 2013. 2 “Ada Zingara,” The Billboard, 14 April 1906, digital image, Old Fulton Post Cards (http://www.fultonhistory.com : accessed 27 September 2013). 3 Wikipedia (http://www.wikipedia.org), “Circassian Beauties,” rev. 18:32, 3 July 2013. 4 Katherine H. Adams and Michael L. Keene, Women of the American Circus, 1880-1940 (Jefferson, North Carolina: McFarland and Company, 2012), 142; digital images, Google Books (http://books.google.com : accessed 27 September 2013). 5 “’Reading’ A Family Photo Album,” Photo Detective with Maureen A. Taylor, 22 September 2013 (http://blog.familytreemagazine.com/photodetectiveblog/ : accessed 27 September 2013). This entry was posted in Photograph Analysis and tagged 1890s, antique photograph, cabinet card, Chicago, circus, sideshow, vintage photograph, Zingara on September 27, 2013 by Melanie Frick. I have a picture of her (Ada Zingara) posing with a snake. Evidentially one of my great granduncles knew her, since she wrote a short poem on the back: “Tis sweet to love/But oh, how bitter/To love a girl/And not to get her/ Oh, Will! Ada Zingara. I’ve always wondered about that lost story. Deja, wow! That is so interesting! I’d be curious to know where your great granduncle lived, and what time period this may have been? I can’t help but wonder who Ada Zingara really was. Thanks for stopping by and sharing!